Straight from CTIA 2008, Everex has unveiled their new Cloudbook Max featuring built-in support for Sprint's XOHM WiMAX network. Users can also expect a 8.9" WVGA (1024 x 600) display, a 1.6GHz VIA C7-M ULV processor with the VIA VX800 digital media IGP chipset, up to 2GB DDR2 SDRAM, a 80GB hard disk drive, 802.11b/g WiFi, Bluetooth, an integrated GPS receiver, dual built-in 2-megapixel webcams, an S-Video port, audio in/out and the Microsoft Vista OS. No pricing info has been announced, but you can expect it to hit store shelves within a year. Press release after the break. Taipei, Taiwan, 1 April 2008 - VIA Technologies, Inc, a leading innovator of power efficient x86 processor platforms, today announced that Everex, a pioneer in developing next generation ultra mobile computing devices, has adopted the VIA C7®-M ULV processor for the new Everex CloudBook Max, a stylish mini-note with a stunning 8.9" screen and integrated single-chip Mobile WiMAX solution from GCT Semiconductor for use with Sprint's high-speed XOHMwireless network. VIA and Everex will display the device for the first time at the WiMAX Experience Lounge in the Central Hall lobby at CTIA Wireless 2008, held at the Las Vegas Convention Center on April 1-3, 2008. In addition, live demonstrations of the Everex CloudBook Max will also be made at GCT Semiconductor's meeting room MR-789 in Hall C of the convention center. Packing in a host of advanced connectivity, computing, and multimedia features into a compact and stylish clamshell form factor that weighs less than 1kg, the Everex CloudBook Max has been designed from the ground up to enable people to fully enjoy the growing array of rich mobile Internet applications and services that will be available on Sprint's XOHM wireless network. "Consumers and mobile workers want to experience the real Internet and all their favorite applications with the same high speed and full functionality whether at their desk or on the go," said Richard Brown, Vice President of Marketing, VIA Technologies, Inc. "With its ground-breaking design and embedded Mobile WiMAX connectivity, the new Everex CloudBook Max paves the way for truly seamless computing whatever your location." "The development by VIA and Everex of the Everex CloudBook Max with WiMAX capabilities from GCT is an example of the embedded device ecosystem at work. 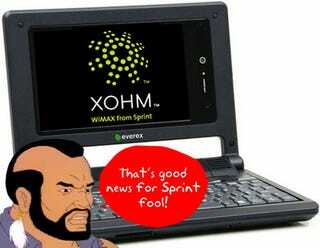 We expect this collaboration, along with others like it, to result in a robust portfolio of WiMAX capable devices," commented Bin Shen, Vice President of Product Management and Partnership Development at Sprint's XOHM business unit. "With the new Everex CloudBook Max, we are extending our leadership in the development of innovative ultra mobile devices that deliver the richest and most compelling experience on the mobile internet," commented John Lin, Vice President Sales and Marketing, Everex. "Mobile devices with embedded WiMAX will continue to require Mobile WiMAX solutions with a smaller form factor and lower power consumption," said Kyeongho Lee, President and CEO of GCT Semiconductor. "We believe that GCT's industry-first, single-chip mobile WiMAX solution provides the optimal features of size and power consumption for the Everex CloudBook Max." Powered by the 1.6GHz VIA C7-M ULV processor coupled with the VIA VX800 digital media IGP chipset, the Everex CloudBook Max supports Microsoft® Windows Vista™ and delivers outstanding graphics and video performance through its vibrant 8.9" WVGA display at resolutions of up to 1024 x 600. With its integrated single chip Mobile WiMAX solution, the Everex CloudBook Max will connect seamlessly to the ultra-fast Sprint XOHM wireless broadband network, as well as to existing 802.11b/g WiFi networks. To provide additional convenience and functionality to the mobile internet user, the device also comes with Bluetooth support, an integrated GPS receiver, and dual built-in 2-megapixel webcams for videoconferencing. The Everex CloudBook Max delivers up to four hours of battery life and also features a full keyboard plus integrated trackpad with two mouse buttons in a stylish and durable form factor that measures just 240mm(w) x 175mm(d) x 27mm(h) and weighs less than 1kg. Other features include up to 2GB DDR2 SDRAM, 80GB hard disk drive, one S-Video port, and Mic-In/Speaker-Out ports. The Everex CloudBook Max is expected to be available in a year.